My name is Frank Trujillo. 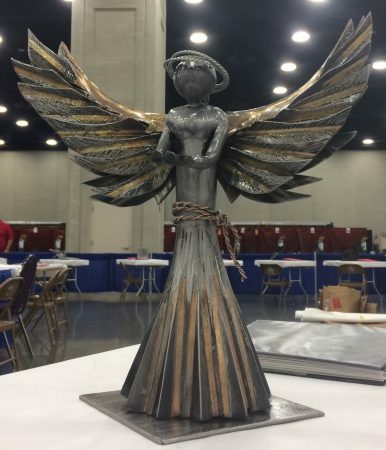 I recently competed at SkillsUSA at the National Competition in Louisville, Kentucky. Throughout my entire journey, it has been quite the adventure. I was honored to win first place in our State which allowed me to compete nationally. I have learned so much from my time competing, and what it takes to get to the next level. I encourage anyone to compete in SkillsUSA, no matter what the skill category. It took a lot of people to coordinate everything. I would like to thank everyone at SFCC for the encouragement and support through it all. I would not have been able to do so much or get so far if it wasn’t for the faculty, teachers, students, friends, and family that supported me. I thank them all for helping me with this wonderful opportunity. The story behind my design came from something I wanted to do for my grandma. In August of 2016, my grandma was diagnosed with stage 4 pancreatic cancer, which came as a shock to us all. I had recently started the welding program at SFCC. I told her that I wanted to make her a guardian angel so that she could take it with her to her chemotherapy sessions. A month later she passed away and I had not yet had the chance to make her a guardian angel. My instructor Jake Lovato announced that there was a competition for the state of New Mexico which included a category for welding sculpture. At that moment, I knew I was going to enter and what I was going to make. I chose my grandma’s guardian angel that day and I stuck with it. I knew more or less the shape and look that I wanted for the angel. I looked around the shop at school for some materials and played with the design using scrap metal. Jake was there to guide me when I needed direction. Each step of constructing my angel had its own difficulties and rewards. I used techniques to make my sculpture from things I had learned in class. I used pipe, angle iron, 1 inch metal strap and silicon bronze throughout my sculpture to make it what it is today. This entire process was an adventure full of learning. I wouldn’t change anything about it. I would like to encourage anyone interested in SkillsUSA to participate. It is a great learning experience, and builds a lot of character. I have learned a lot about myself throughout this journey.